The Gale & Martin Casino Bonus is positively massive! All new players can claim huge match bonuses and free spins on their first 2 deposits. On your first deposit at Gale & Martin you will be awarded a 250% Match Bonus up to €2,000. 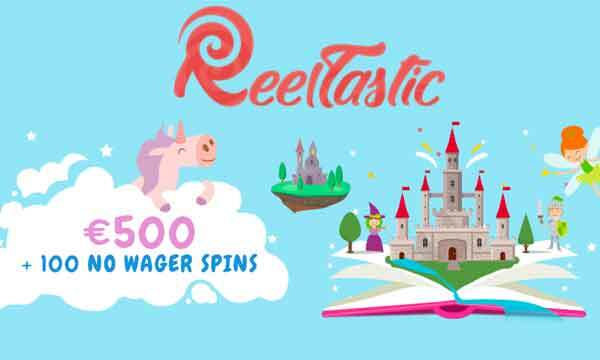 Plus you will also receive 50 free spins on any Play N’ Go game. If you thought the first deposit bonus was good, you’re in for a real treat because the 2nd deposit bonus is even bigger. 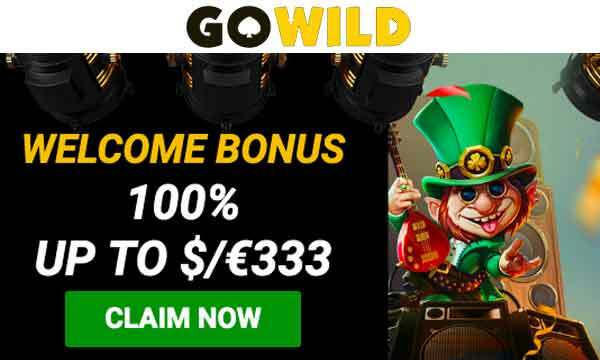 You can claim another 50 free spins on any Play N’ Go slot plus get an enormous 300% Deposit Bonus up to €2,000! I’m sure you agree that this really is a superhero welcome package. If you like big deposit bonuses check out our section on 200% Casino Bonuses. 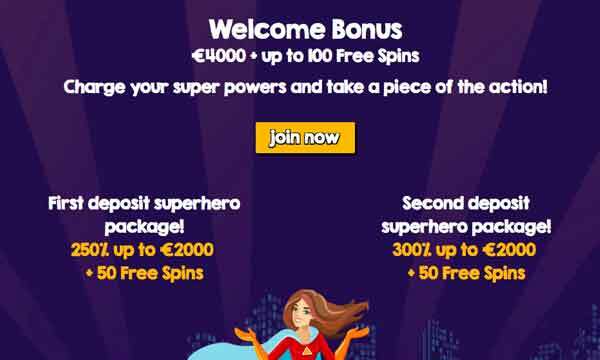 There is a minimum deposit of €20 required to claim both the 1st and 2nd deposit bonuses in the Gale & Martin Casino Bonus. Wagering for this bonus is set at 30x the sum of the deposit plus the bonus awarded. There are some well known software providers and some not so well known providers at this casino. If you’re bored of all the same old NetEnt games then this is a great opportunity to try something a little different. The slot games supplied here are provided by Betsoft, Playson, NYX, Evo Play, Fugaso and many others. Or if you rather playing table games, there are also plenty of choice here between traditional and Live Casino games. Game in the live casino are powered by Pragmatic Play. 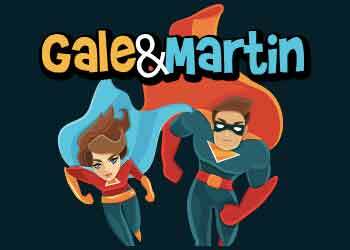 Gale & Martin Casino has a cartoon super hero theme that adds an element of fun when playing here. It’s a site that doesn’t take itself too seriously and offers some fantastic games for you to play. The games may be slightly lesser known but that doesn’t mean that they are worse. In fact it’s a great opportunity to try something and possibly find a new favourite. There is a large volume of slots and live casino games. Many of these live casino games are provided by Pragmatic Play. The Gale & Martin Casino Bonus for new players is one of the most generous in the market at the moment. 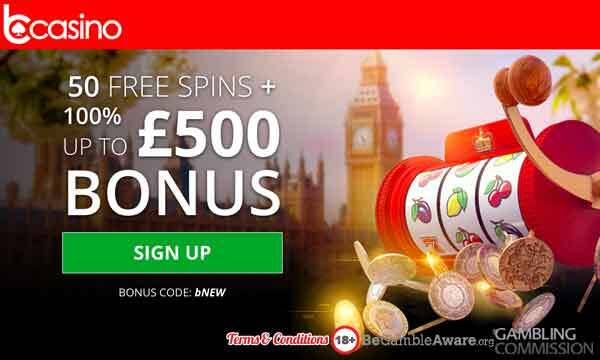 You can claim a massive €4,000 in bonus funds plus 100 free spins over your first 2 deposits. Customer support is available at this casino via a live chat facility. There are a number of secure payment options available at Gale & Martin Casino. They include Visa, Maestro, Skrill, Neteller, Entropay and Bitcoin. Please note: this casino is not regulated by the UKGC.